Baile Flor de Piña: Cultural Misrepresentation or Cultural Preservation? The annual Guelaguetza Festival in Oaxaca is not without controversy. Every July, locals and visitors alike, converge on Oaxaca City to witness traditional dances representing Oaxaca’s diverse regions and ethnicities. From the languid shuffle of the “Zandunga” of the Isthmus of Tehuantepec, to the China Oaxaquenas twirling in their brightly colored skirts, and the Jarabe Mixteco banda music that fills the crisp air of Oaxaca, the dancers showcase a piece of their cultural heritage. One dance in particular, is highly anticipated and invariably brings down the house. The “Baile Flor de Piña”, is best described as Radio City Music Hall Rockettes wearing traditional dress from Mexico, carrying a pineapple on their shoulder. The choreography is grand, repetitive and designed for high visual impact. Yet, what really steals the show are the brightly colored Chinantec and Mazatec huipiles worn by the dancers. The controversy surrounding the Guelaguetza Dance Festival is not new. Many say it has strayed from its original intent. 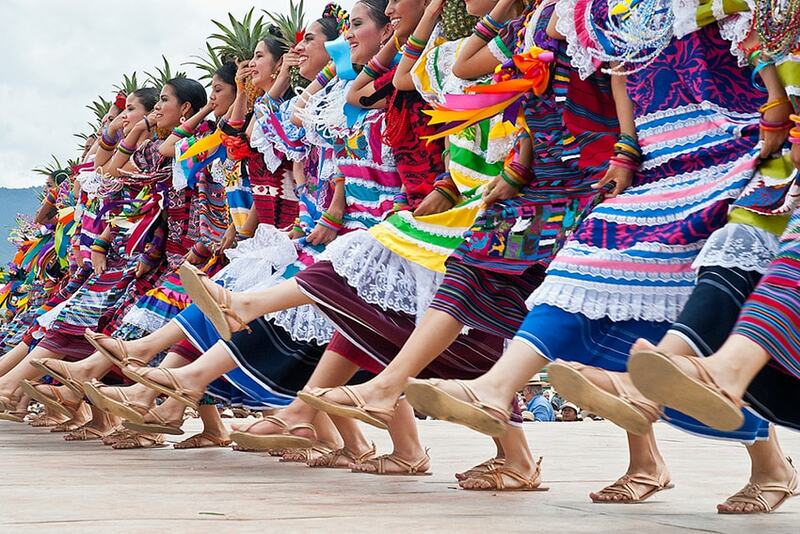 The Guelaguetza began as an informal gathering in the 1920’s to boost morale after a serious earthquake. In the 1970’s it became more formal, with a dedicated stadium and today, with the new “Cerro de Fortin” amphitheater, it has become a big statewide, national and international extravaganza, bringing tourists from all over the world. The festival is criticized on several fronts: that it is no longer by the people or for the people (no longer a popular gathering), and while there is a “committee of authenticity” (another controversy), the dances and/or music don’t necessarily represent the true cultural heritage of Oaxaca’s regions; the event is designed for tourists, where even the price of admission is prohibitive to locals. Also, the true meaning of the term and concept of “guelaguetza” is completely lost, as “guelaguetza” is an ancient form of communal exchange based on reciprocity. The Baile Flor de Piña is an unapologetically contrived and created dance. It does not make any attempt or claims to be ethnographic nor ancestral. It was created or “invented” in 1958 by a dance choreographer, Paulina Solis Ocampo, who was commissioned to create a dance to represent Tuxtepec in the great national dance festival, the Guelaguetza. Feeling left out, the then Governor, Alfonso Perez Gasga, put the call out to create a dance that would best represent Tuxtepec. This way, Tuxtepec could participate in the event and not just attend as an observer. Paulina Solis Ocampo set out to choreograph a dance that would be, “the most beloved dance of the Guelaguetza”. She succeeded, as the dance was an instant sensation and to this day is a highlight of the festival. But how to represent a region of disparate cultural and ethnic influences? This region of Oaxaca is Chinantec, Mazatec, some Cuicatec and its main city, Tuxtepec is part of the Papaloapan River Basin, having more in common with the “jarocho” culture of the Sotavento in the southern coastal regions of Veracruz. Solis Ocampo identified the singular cultural traits of this region and decided that front and center would be the gorgeous and very identifiable “huipiles”, the woven and embroidered dress of the region. Since there was no representative music or dance of the region, other than “jarocho” music, which is more identified with Veracruz than Oaxaca, she created the music (based on a type of “son” genre) and she completely made up the dance. The other key element she incorporated was the pineapple, the tropical fruit that grows so abundantly in this region; particularly in Loma Bonita! So with the huipil and the pineapple as her hallmarks, she created, the Baile Flor de Piña. The controversies surrounding Baile Flor de Piña include: a.) it is not ethnographic (never was intended to be); b.) the women of the communities represented IN the dance do not PERFORM the dance. The “mestizas” from Tuxtepec are the ones who learn, practice, perform and represent the dance and their region. This criticism has been met with the defense or apology that it was just not logistically practical for the young women from the seven regions: Valle Nacional, San Lucas Ojitlan, San Felipe Usila, San Pedro Ixcatlan, San Miguel Soyaltepec, Japapa de Diaz and Tuxtepec to travel and convene on a regular basis to practice the dance; the distances being too great. Some think it is racism and/or elitism. And c.) The most recent critique of this dance is that its presence in the Festival’s four segments (morning/evening of the first Monday and morning/evening of the following Monday), inhibits the opportunity for other communities of Oaxaca’s regions to participate and showcase their culture and traditions. 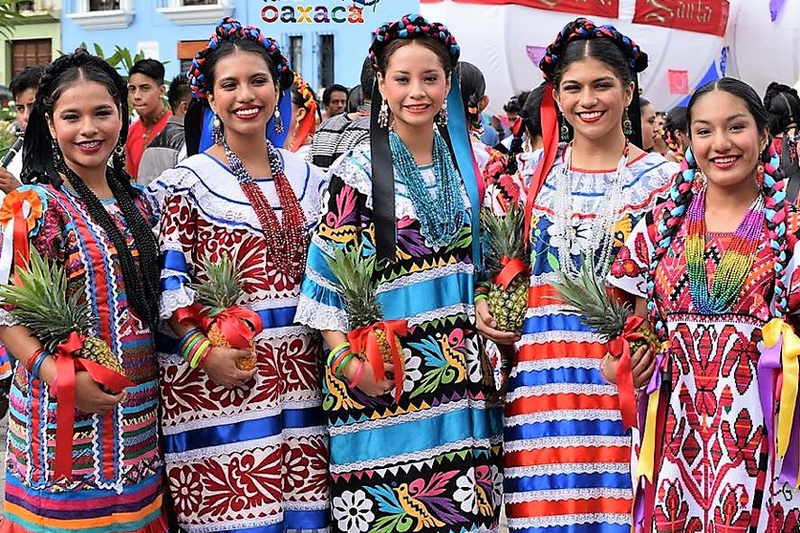 This being said, distinct dance troupes from the Chinantec, Mazatec and Papaloapan Basin, representing Loma Bonita, San Pedro Ixcatlan, Huautla de Jimenez, San Felipe Usila and Santiago Jocotepec will participate in this year’s Guelaguetza. So, while there is nothing ethnographic or traditional about this dance, and the women do not come from the communities the dance represents, one thing IS ethnographic: the dress. The Chinantec huipiles come from the communities of: San Felipe Usila, San Lucas Ojitlan and Valle Nacional. They are woven on a backstrap loom, with the design motifs either embroidered or brocade woven into the base woven cloth. The motifs are double headed eagles, Quetzalcoatl (plumed serpent), peacocks, diamond shapes, humming birds, all in geometric layouts. The Mazatec huipiles come from Jalapa de Diaz, San Miguel Soyaltepec and San Pedro Ixcatlan. The glorious birds and flowers that densely populate these huipiles are embroidered on commercial cotton fabric. Both the Mazatec and Chinantec huipils are embellished with lace and satin ribbons, commercial products that were introduced. The plethora of colorful woven and embroidered motifs, combined with bright satin ribbons, finished off with a coquettish lace around the sleeves and hem, make these huipiles distinct and beautiful. Paulina Solis Ocampo knew this, and that by uniting 30+ women in beautiful traditional regalia in a line formation would create a visual splash and sensation. She was right. Add the pineapple on the shoulder, throw in some choreography, and it brings the enthusiastic crowd to their feet. Visitors go home happy knowing they’ve seen and experienced the now famous “Baile Flor de Piña” dancers at the Guelaguetza. On our recent journey to La Chinantla on a trip called, “In the Footsteps of Irmgard W. Johnson” (a pioneering and renowned textile anthropologist of Mexico who studied this region), a group of travelers set out to learn and take notes on what we observed in the communities and to ask the artisans about production and markets for their textiles. Key points we learned: The production of traditional textiles in the Chinantec and Mazatec regions of Oaxaca is predominantly for external markets (to sell). In the case of San Miguel Soyaltepec, the artisans said, “All of our production is for selling. We make our embroidered huipiles with the intention to sell them.” In the case of Rancho Grande, Valle Nacional, interestingly, we learned that 80% of their annual sales of huipiles come from and during the Guelaguetza festival in Oaxaca in the month of July. The sales go to the women dancing in the Guelaguetza but also to the fans, who like to wear the huipiles, much like sports fans would wear their favorite team’s jersey. The Baile Flor de Piña has become known outside of Oaxaca and even Mexico. One textile collector told me that he started to collect textiles after seeing the dance (and the beautiful huipiles) performed in Houston. So, while the Baile Flor de Piña dance is not ethnographic and the Guelaguetza Festival has its share of controversy, they are key contributors to the ongoing tradition and preservation of the Chinantec and Mazatec dress and weaving / embroidery techniques. Because of this, we think they are both contributors to cultural preservation. Information for this blog was generously provided by our friends and artisans in the region including, Jose de Jesus Fernandez, a recognized Dance Instructor from Tuxtepec, artisans in San Miguel Soyaltepec and in Rancho Grande, Valle Nacional, and the publication, “Yo Soy Flor de Piña” by Rony Manuel Ortega Ruiz.